What is a Condensed or Narrow Font? The letters of a condensed font have narrow widths, compared to similar typefaces in the same family. It’s also about the relative height and width of a font. If it’s much taller than it is wide, then it’s likely to fall into the bracket of a “condensed” typeface. They’re not suitable for use everywhere (and they can be particularly difficult to read if you’re using them for body copy, or large paragraphs of text). But, used for headlines, quotes, logos, and places where you want your text to stand out, narrow fonts can be a great choice. Here are some examples of, in our opinion, the best condensed and narrow fonts to get you started! Devant Pro is a modern condensed narrow font that features a big and bold design, making it perfect for website headers, posters, banners, flyers, and much more. It comes with OTF and TTF as well as Web Font versions. Tallios font comes with a narrow design and stylish rounded edges. It’s most suitable for crafting social media posts, quotes, posters, and T-shirt designs. The font includes both uppercase and lowercase letters. Gatsby is an elegant condensed font you can use for all kinds of professional, business, and branding designs. It seems particularly more suitable for luxury brands and fashion-related design projects. Calcio font features a highly condensed design that gives it a narrower look. The font is best for creating titles, headers, and posters. It includes both uppercase and lowercase letters and symbols. Nomads is a condensed font that comes with a vintage design. It’s best for crafting badges, labels, and logos for vintage-themed businesses and brands. The font comes in Regular, Rounded, and Vintage styles. Chillvornia font comes with a unique handcrafted design with decorative letters. The font is perfect for designing modern-vintage badges, posters, titles, and headers. Nordams is a family of condensed fonts that comes with various styles and weights. It includes 12 different font styles in 5 different weights ranging from thin outline to bold and more in between. Yafeu is a bold narrow font you can use to design different types of print and digital creations, including posters, banners, flyers, and website headers. The font includes uppercase, lowercase letters, numbers, and punctuations. Sabang Island features a unique design that will surely make your designs stand out from the crowd. The font comes in clean and rough styles, both of which includes uppercase and lowercase characters and numbers. Manufaktur is a massive font family that comes with a total of 60 fonts. It includes fonts in 5 weights and 3 styles, all of which also ranging from 3 widths from condensed to expanded. Lonssa is a gorgeous condensed font that comes with a stylishly narrow design. It’s perfect for feminine product design as well as your lifestyle blog headers, book covers, greeting cards, wedding invitations, and more. Maxwell is a minimalist narrow font that features a mixed modern-retro design inspired by the text and sign designs from the 1950s. This font comes in both uppercase and lowercase letter versions with alternative characters and glyphs. A font made specifically for luxury brands and high-end products, Vera is ideal for showing off authority and class. Vera features a design similar to the font used by Vogue and it comes in rough, regular, and oblique versions. Checkpoint is a professional multilingual font you can use with almost any type of design work, including logos, signage, banners, posters, and much more. The font also comes in several different versions ranging from light to bold. This highly creative brush font also features a narrow condensed design. It supports multiple languages and comes in several font variations. It’s great to use with your greeting card designs, social media posts, and poster designs. Hammerhead is a big, bold, and condensed font that you can use for vintage and retro-themed designs, including logotypes, signage, website headers, banners, and posters. The font includes both uppercase and lowercase letters and comes with 252 glyphs. Curvos is a stunningly designed condensed font that features a pop art-themed design. This font is perfect for badge designs, logotypes, website headers, social media posts, and more. In fact, the font comes bundled with 6 unique badge designs as well. A brush font featuring a stylish condensed design. This font features a mix of both modern and vintage design elements that will add a unique attractiveness to your various design works. A yet another brush that comes with a truly natural look and a rugged design. The font is available in several different styles and it includes swashes, automatic double-letter ligatures, and more handcrafted design elements. This is the type of font that you usually see on greeting cards and wedding invitations. Minty March is a condensed font that also doubles as a serif font. It includes both uppercase and lowercase letters with numbers, ligatures, and more. Selecta is a rounded sans serif condensed font that’s perfect for poster and website header designs. The font also features a professional design that makes it suitable for logotypes and branding work as well. This unique font features a design inspired by the details seen in the Italy’s Stile Liberty. It’s been designed as a “tribute to Italy of the early twentieth century,” which makes it the perfect font to be used with your vintage and classic themed designs. Tinsel is a family of fonts that features several condensed typefaces. You can use the font for branding work like letterheads, logotypes, business cards, and other professional designs. This font features an ultra-condensed script design that aims to give your text a natural hand-painted look. It will go along great with T-Shirt designs, logos, and other creative design work. This beautiful and hand-drawn condensed font family includes 8 unique typefaces, including Sans, Serif, Slab, Stencil, and more. Each font in this family comes with 92 matching catchword and icon glyphs, which makes this the perfect font for designing logos and signage. Blocklyn is a great font for showing your titles and mission statements in big bold text. The font family features 4 typefaces Condensed, Condensed Italic, Grunge, and Grunge Italic. It also comes with 2 bonus PSD mockup templates as well. Inspired by retro fonts from the 1950’s, the Maxwell Sans font features two typefaces: Regular and small caps. The clean and minimal design of this font makes it best for both headline and body text. This condensed web font comes with a creative touch and unique design. The font is available in three versions: light, regular, and bold. It seems ideal for website headers, titles, and even logo designs. BiteChalk font will make your text look as if they were drawn on a blackboard. 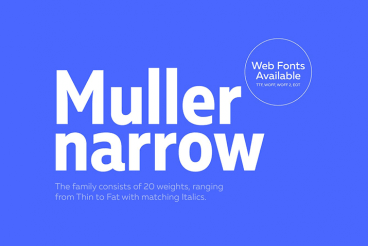 This font comes in 4 typefaces, including regular, bold, normal, and slim. It’s a unique font you can use for designing restaurant menu boards, signage, posters, T-Shirt designs, and much more. This all-caps grotesque type font features a minimal and an elegant design for making your logotypes, magazine, and poster design look more professional than ever. Carnot font also supports over 20 different languages. Essenziale is a minimalist and an ultra-condensed font family that comes in 8 versions, including Bold, Slab, Slab Bold weights, and more. Each font in this family features unique characters, making a total of 412 glyphs in the font family. This is a professional condensed serif typeface that’ll make your text looks like something you usually see on modern magazines and corporate websites. The Global font is perfect for your formal and commercial designs. Bahn is a rough font that’ll go along nicely with your entertainment and playful designs. This condensed and vintage-style font comes in 3 weights and 228 glyphs. At first sight, you can see this font being used for a logo, signage, or a header design. The bold retro design of the font makes it perfect for such designs. The font comes in both uppercase and lowercase versions. Mangano features both a clean and rough worn off design with a mixed modern/vintage look. It comes in uppercase and lowercase versions for creating signage, logos, T-Shirt designs, and more. This slightly rounded multilingual sans-serif typeface supports spanish, portuguese, german, danish, french, and a number of other languages. The modern look of this typeface makes it ideal for any type of design work. Gatsunaga is a condensed brush font that features a design inspired by a samurai sword strikes. Hence the sharp edges and precise flow of the font design. It looks perfect for book covers and movie posters. Nedo is a display font that features both normal and condensed versions. The retro look of this typeface makes it the best choice for neon signs, T-Shirt designs, and logo designs. The designer of this font has put a serious thought into crafting each letter in this Neo-Grotesque sans typeface in precision. The font comes in both normal and condensed versions. This font looks great for crafting social media content and website headers. The Timber typeface features an old vintage look along with grunge elements. Amorie is a hand-drawn font that comes in a number of weight, styles, and glyphs. This font will help add a little human touch to your digital graphic designs. This is yet another handwritten condensed sans serif font that includes 300+ glyphs and comes in .otf, .ttf, and web font versions. It’ll look great with your header and poster designs. Muller font not only features an elegant modern design, but it also comes with a massive collection of 20 different weights. The font has been designed to be used as both a header and body text font. Web font formats are also included in this font family. Hipstetic is a font family that features a mixed design of hipster and vintage looks. It comes in 4 different font variants and 100 glyphs. Perfect for book covers, website headers, signage, and more. Aracne is a handwritten font that features slightly scrawled letterforms with a natural look. It also comes in regular, condensed and ultra condensed styles to fit in with different types of design work. This hand-drawn font pack comes in 5 font families and with 2 graphic ornament fonts, each with its own different styles and weights. This font pack has everything you need for crafting restaurant menus, quotes, signage, logos, headers, and much more. Once you’ve found the best condensed font for your titles, then comes the challenge of finding a matching font for body text. Keep exploring Envato Elements to find the right font combination for your design projects. And have a look at our modern serif fonts and script fonts selections for more inspiration.